The numbers are overwhelming: Twenty-one national championships (and counting). The two greatest coaches, in terms of winning percentage, that college football has ever produced. Seven Heisman Trophy winners. Dozens of All-Americans. Countless statistical milestones. But the numbers alone don't do justice to the impact that Notre Dame football has had and continues to have on its legion of fans, both in South Bend and across the nation. What takes place within the storied confines of Notre Dame Stadium under the watchful eye of Touchdown Jesus is more than simply a game; it's a way of life. 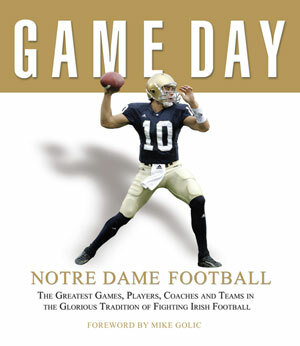 Legendary coach Ara Parseghian put it this way: "There is a Notre Dame mystique that defies definition or description. It is something special in its combination of religion, education, and athletics. It is not only national, but international in scope. And there is a real tradition of achieving excellence whatever the odds." Game Day Notre Dame Football is a celebration of that mystique, and of the decades of gridiron excellence that have inspired it.